More sweet fruit from the Kickstarter tree. This was pitched as a spiritual successor to Syndicate (the original, not the remake) and while it didn’t get all of it’s stretch goals it hit its target. 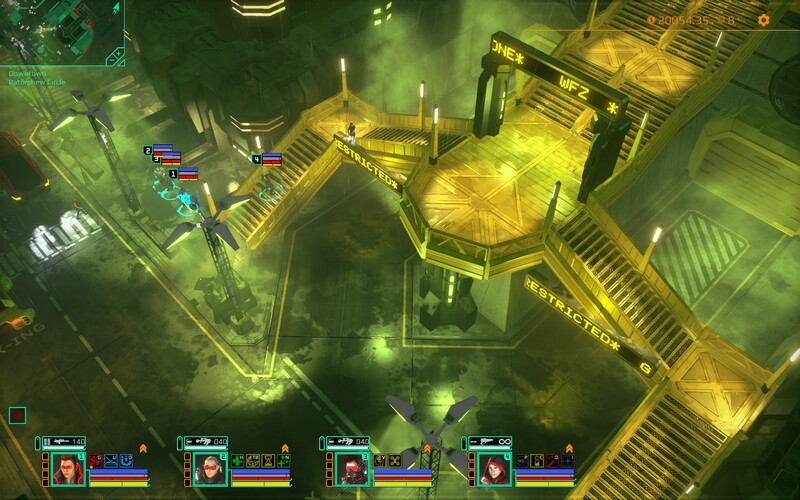 Satellite Reign was released last week and here’s my spoiler-free thoughts.The original Syndicate was one of the first games I ever got on a PC. It wasn’t quite the first (I think Falcon 4 and Ultima 7 came first) but I remember being blown away by its hi-rez graphics; it rendered in 640 x 480, an unheard of resolution (more than you’d ever need). It did this without using SVGA either by using a cunning system that allowed higher resolutions, but only with 16 colours (not 16-bit colours, 16 colours). Pretty clever. 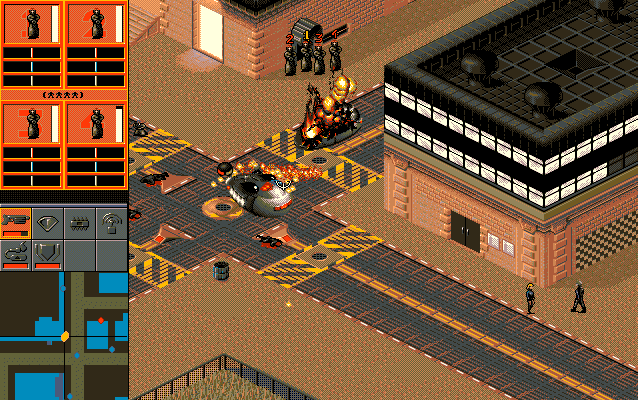 It was an isometric action game where you controlled four agents in a dystopian future. You were the boss of a corporation, at war with your rivals in other corps. The agents were your instruments and you performed missions in a section of the city, upgraded your weapons and subjected your agents to mandatory cybernetic improvements. On each mission there was an astronomic body-count as civilians were shot, blown-up, barbecued or mind-controlled by your team. None of this mattered as your character was a sociopathic corporate overlord, only concerned with profit, experimenting on your ‘volunteers’, pumping your agents full of narcotics and crushing your enemies into the dust. Basically a cross between Rubert Murdoch, Joseph Mengele and Walter White. 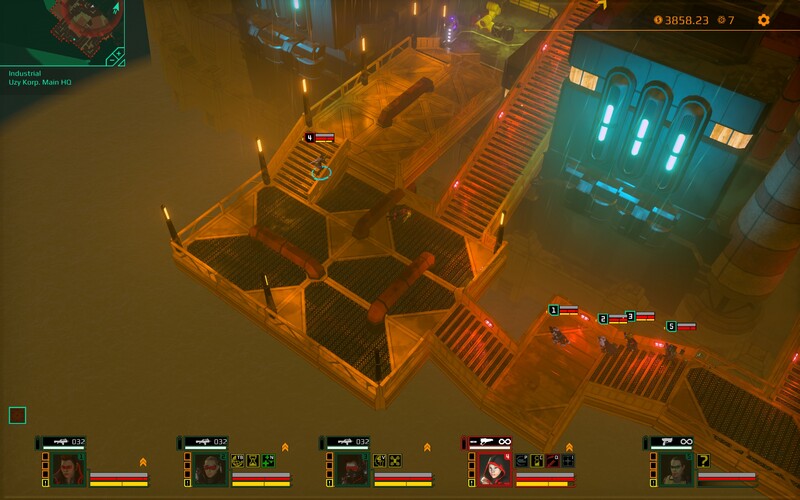 You eventually assassinate and subvert your way to the end of the game and fight your way through the Atlantic Accelerator. If you win (the level was famously tough) you’d be top-dog. 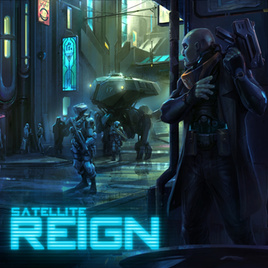 Satellite Reign is a spiritual successor in more ways than one. 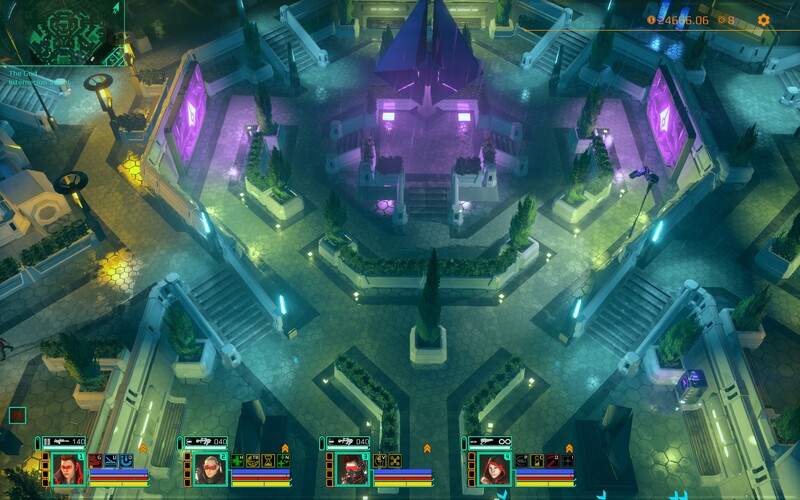 Thematically, the game follows on from the world portrayed in Syndicate where everything is controlled by the corporations. One of them is on the cusp of perfecting functional immortality and your rebellion is trying to break the corporate power structure their stranglehold on the world becomes permanent. 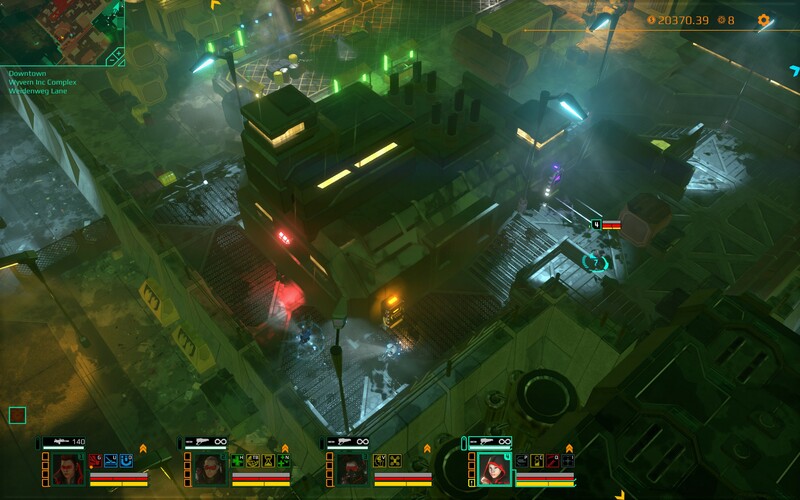 Unlike the original Syndicate you have four agents each with a different class; Soldier, Support, Hacker and Infiltrator. If one gets bumped off you can transfer their skills and personality to a new clone (part of the game is ‘persuading’ civilians to become DNA donors). As long as you keep your supply of clones high you can re-clone your agents after a disaster. And as the game goes on you want to keep those agents. Each class has a set of skills they can learn on top of the slots for weapons and augmentations. Each increases the cost of deploying a new clone and if you get the ability to ‘hot-drop’ clones it gets even more expensive. It’s pretty cool; losing an agent is painful but not necessarily game-ending. 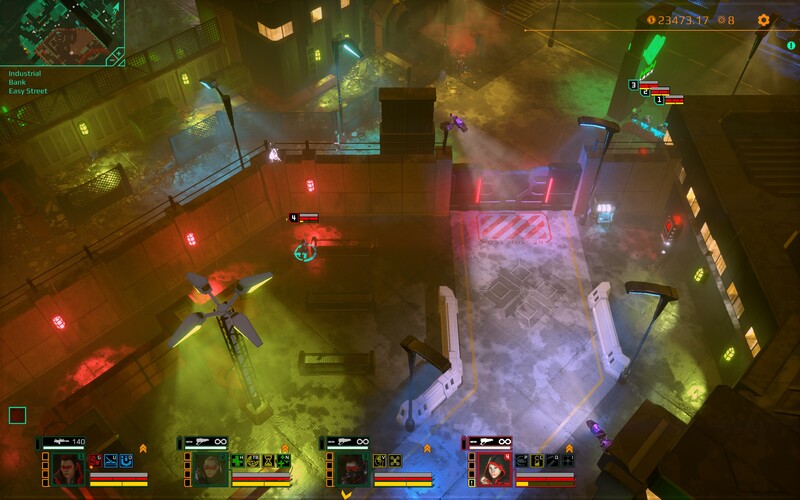 Satellite Reign is an isometric open world where you can send your team anywhere you like to advance your aims. You normally have a list of potential missions but you can accomplish them in whatever order or whatever way you choose. Or not achieve them at all; I got distracted by an opportunity to rob a bank (two guards had left it to arrest another civilian) while in the middle of infiltrating the guard’s HQ. Whatever you decide to do you can go in all-guns blazing, stealth it, hack gun turrets, zipline in, use an energy surge to super-sprint in or whatever you feel like doing. Hybrid strategies work well too. 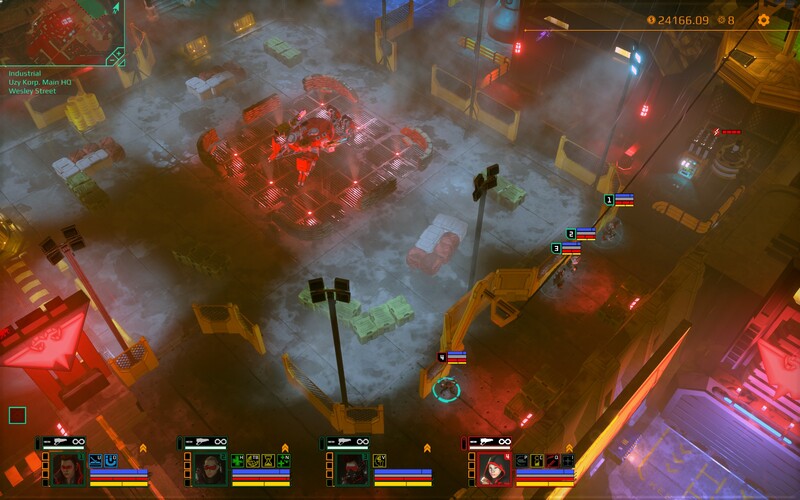 And by ‘hybrid’ I mean ‘stealth strategy executed so ineptly the mission turns into a fire-fight’. A lot of that is to do with my ineptitude but it’s not helped by a tricky control system. There’s a lot of complexity in the controls and because the game runs in real time it’s easy to blindly flail about and execute the wrong command. This is made more of an issue by the precise requirements of some of them. To get your agents into cover you need to right-click on a valid location (on one side of a wall) when the ‘use cover’ icons have appeared. It’s not obvious normally how much cover is available; for example, a wall might only give cover to 3 of your agents so the fourth gets to play ‘catch the bullets with your teeth’ while everyone else cowers from the mini-gun wielding policemen. Your agents have a ‘weapons out’ toggle. This is individually set for each agent. Certain actions cause your agents to draw their weapons and that changes how the right-click works; it’s very easy to get into the state where one agent has a weapon drawn by accident and then your ‘select civilian’ command turns into a ‘incinerate civilian’ command, normally in full sight of a security camera. I had loads of issues where my agents would seem to draw their weapons without me asking them to, or they’d lose their orders when I scrolled the screen. It turned out when I reset the scrolling keys to ‘WSAD’ (the choice of champions) it didn’t automatically remove those bindings from their other uses. So when I used ‘S’ to scroll down, I was also giving the order to stop. Or when I scrolled left I’d be giving an attack-move order. Sigh. Each agent’s special abilities have an individual hot-key. While you can click to use this can be a bit fiddly because the game runs in real-time accurate; quick clicking on the minuscule icons is quite hard. You can get an ability to slow-down time which mitigates this and in a later patch they allowed players to start the game with that ability. This takes the edge off of the fight difficulty and you can upgrade it so that it gives you loads of benefits while it’s in use. A peaceful plaza soon to be de-peaced. The sandbox world is brilliant fun. Money can be earned by missions, robbing banks (or corporate offices), looting stuff or hacking ATM’s around the map. This can create impromptu mission-planning sessions where an interesting item is secured via gates, camera’s and patrols. Bribe the guard? Hack the camera? Shutdown power to the gate? Force the gate then hack the terminal while the other three agents hold off the corporate guards? I hacked open a gate and ran inside while trying to get a scientist out. A corporation’s guards were suspicious and followed me in and soon got discovered by the local guards. As the two corps were at war, a fire-fight erupted which allowed me to quickly change my plans and skirt the fight over a high walk-way. Blowing the power on an internal gate, locking the patrolling guards in there. But they raised a call and a techy came out to repair the damage, suddenly giving me a clock to beat before the guards got out. A fire-fight with heavy ordinance trashing the web of power connectors and generators suddenly making me change route because the side door I was moving towards was suddenly inert. It’s a brilliant game. Get passed the unforgiving controls and the (dystopian) world is your oyster.